In the United States, 80 percent of the corn and 22 percent of wheat is grown for “livestock” food. 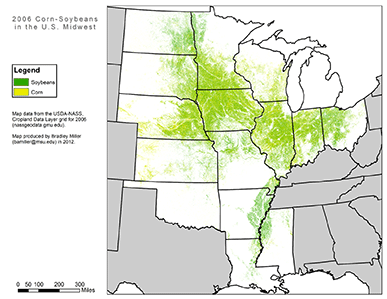 Some 75 percent of the soybean crop in the U.S. goes to feed them. Corn and soybean crops occupy a combined 145.2 million acres of U.S. habitat but this varies year-to-year. More than 70 percent of the Mississippi basin’s botanical agriculture yield, most being corn and soybeans, is grown to feed livestock. This watershed area extends from Montana to Minnesota to Ohio and Louisiana. It is pockmarked by genetically modified organisms (GMOs) whose pollen spreads with the wind. Soil, livestock sewage, herbicides and pesticides, and manufactured fertilizer are transported off this land by rain, wind, and melting snow into the Gulf of Mexico where it creates a massive “dead zone”. That is slowly becoming common knowledge. It’s more complicated than that as market conditions change and other uses for these crops come into play and produce their own byproducts that are fed to animal agriculture’s victims. And we know that livestock, including the egg and dairy food businesses at any scale, returns a small fraction of the corn’s energy and nutritional value as edible food. Still, we seem not to comprehend the extent to which ecosystems are obliterated by animal agriculture. When we graze millions of non-native cattle and sheep who displace the original species, or feed them with fields of botanical crops that have the same effect, we cannot avoid profound outcomes for our human ecology, ecosystems, and wildlife management. Pretending we can make it work by killing wolves and coyotes, poisoning prairie dogs, and killing millions of native birds by chilling them to death with chemical sprays, the insanity of it all rolls on and on like a steamroller chasing you in a nightmare. Some one to two percent of the Midwest prairie ecosystems remain. These two images show rough comparisons of where the original prairie ecosystems existed and now where the highest producing areas of corn and soybeans are grown instead. Michael Pollan’s omnivores, “humane” organizations that partner with any form of animal agriculture and its retailers, the countless “environmental” organizations that refuse to acknowledge the issues of human overpopulation and deny we must end animal agriculture, and it must be said, good people who are stuck in vegetarianism as I was for 30 years, are responsible for needlessly destroying biodiversity and perpetuating the unfathomable suffering that remains unacknowledged by the majority of people on the planet. But there is a grand possibility in all of this. We are the new response. As more of us use our power and switch to veganism and other environmental tenets, impacts upon ecosystems and species drops precipitously, and we do it more effectively than any mainstream environmental organization proposes. We end the harm to billions of individuals from other species, domesticated and wild, sentient and non-sentient, and the sacred ecosystems that enable all life.